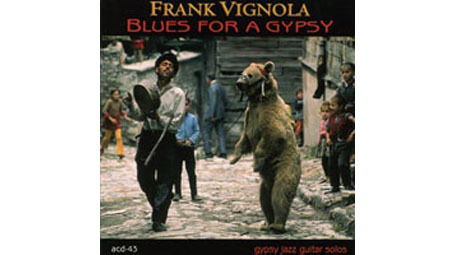 Guitar genius Frank Vignola makes an auspicious Acoustic Disc debut on Blues for a Gypsy (ACD-43). The top ranked, New York-based jazz guitarist who currently performs with both the Mark OConnor and Les Paul Trios, delves into acoustic solo renditions of gypsy-inspired music. Displaying his finesse with original compositions "Gypsy Fire," "Gypsy Dreams" and the title track, Vignola pays respect to legendary guitarist Django Reinhardt ("Tears," "Manoir de mes Reves") and performs unique interpretations of compositions by Charlie Parker ("Donna Lee"), Les Paul ("Cryin") and Erroll Garner ("Misty").